I have a mini peach tree. It is the middle of Aug. Should it be losing its leaves already? How much water should I give it? It is in a container. 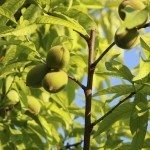 Is there a dwarf peach tree with regular size fruit, and what is the best one? This time of year, tree in containers should be watered daily, twice daily if the temps are above 85 F. A lack of water will cause the leaves to fall off early. Try looking at the Red Haven Peach Tree. I think that will fill all the requirements you are looking for in a tree.